Grassroots football coaching is at its “highest ever level” with over 700 qualified coaches working to improve grassroots standards reveals a McDonald’s football study. 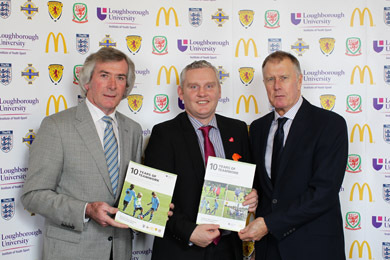 Sir Geoff Hurst, Director of McDonald’s Football, and Football Head Pat Jennings with South Down MLA Jim Wells, centre forward, at the launch of the report – “Ten Years of Teamwork”. Over the past ten years grassroots football coaching has seen a surge in popularity across Northern Ireland, with 727 qualified coaches now actively involved in the grassroots game, according to a report by McDonald’s. The report –Ten Years of Teamwork – was commissioned by McDonald’s to celebrate the tenth anniversary of McDonald’s Community Partnership with the Irish FA. The report set out to review what has been achieved over the last ten years in the grassroots game and to understand how the voluntary game can be developed further. * Together McDonald’s and the Irish FA have created over 700 new qualified coaches in Northern Ireland. * 45 clubs each year gain the McDonald’s club accreditation mark. * 90 coaches each year receive ongoing coach mentoring, plus there are four large scale master classes where a minimum of 60 coaches attend. Another area that has seen a real shake up is the children’s game, which has benefitted from the McDonald’s Small Sided Games programme. 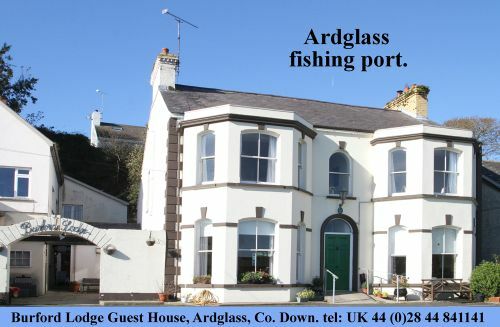 The programme takes place at over 50 locations across Northern Ireland, with over 500 teams and 6,000 children taking part. 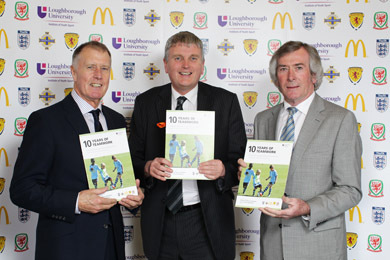 John McCallister MLA, centre, joins the launch of the McDonald’s soccer report at Stormont. The growth in popularity of the grassroots game and coaching has been hailed by Northern Ireland legend and McDonald’s Head of Northern Ireland Football Pat Jennings as “hugely encouraging and potentially brilliant for the future of the game”. The study was compiled in association with Loughborough University’s Institute of Youth Sport, by the Senior Research Associate Dr Steven Bradbury and Professor Barrie Houlihan, who analysed the growth of grassroots football across the UK. Dr Steven Bradbury said: “The grassroots game across the UK during the past decade has undergone a major transformation, with a dramatic surge in the number of qualified football coaches in Northern Ireland.